Mais Fica Winery is a small, family-owned winery in the Placerville area. They had a family created website that was fine at the start and focused on home wine making. After years of hard work, it was time to produce wine and create a site that could grow with them and offer their wines for sale. They now have a great looking site ready to grow as their business does. Like what you see? Think it could work for you? Contact us. 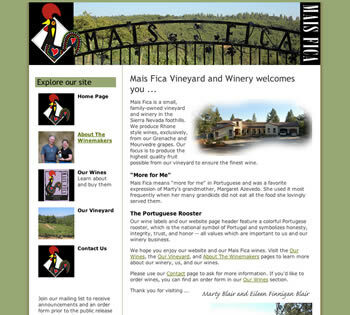 Visit Mais Fica Winery's website.